Full day or half day workshop experiences. Come & create in Sharon’s Garden Studio in St Ives, Cornwall. Class size limited to 1 – 3 adults. All materials included plus lunch (full day) & refreshments (half day). Date to suit you – please contact Sharon to discuss. No experience necessary. Each participant will be able to complete and take away a finished piece. Create a unique artwork during this full one day workshop. Make an unusual decorative wall panel using copper & brass sheet & wire. Using Sharon’s own work as initial inspiration various metalwork techniques can be utilised including soldering & heating the metals for decorative effect. Create a unique artwork during this full one day workshop. Make an unusual decorative wall piece using copper & brass sheet & wire. Create birds/leaves/animals/mermaids etc using Sharon’s work & source books for inspiration. Various metalwork techniques can be utilised including soldering & heating the metals for decorative effect. Make a decorative garden ornament to hang or place in a pot. Working with copper sheet & wire, construct flowers, birds or insects for a unique addition to your outside space. Create a selection of special one off greetings cards with metalwork embellishments. 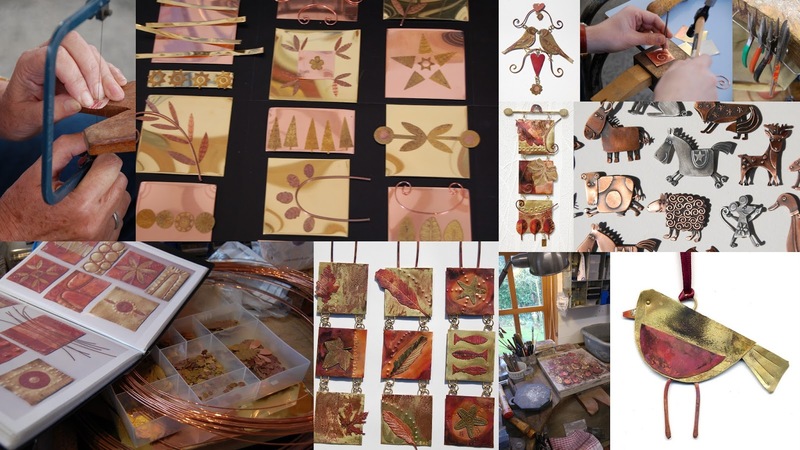 Using copper & brass make mini works of art to attach to cards (ideal to frame too). Design & make a selection of unique metal Christmas decorations to adorn your tree or give a special gifts. Using copper & brass sheet & wire with decorative effects. Flexible dates – please contact Sharon to discuss availability. Deposit of £20 required to secure place. Payment in full on the day.